Prepare a bain marie. Fill a pot up with water a little less than midway and bring it to a boil. In a heat proof bowl (we didn't have one here so we improvised) add your ingredients. Stir during this slow cooking process. Really , Fred is a clown. I mean besides having a bit of fun in the kitchen, he is a professional clown in the performing arts. You can usually catch his performance in Paris. It's a fun family moment to share. Check in for his next performance here. Recently, he acquired some heavy duty, vibrant orange cleaning gloves and he was showing them off to me. 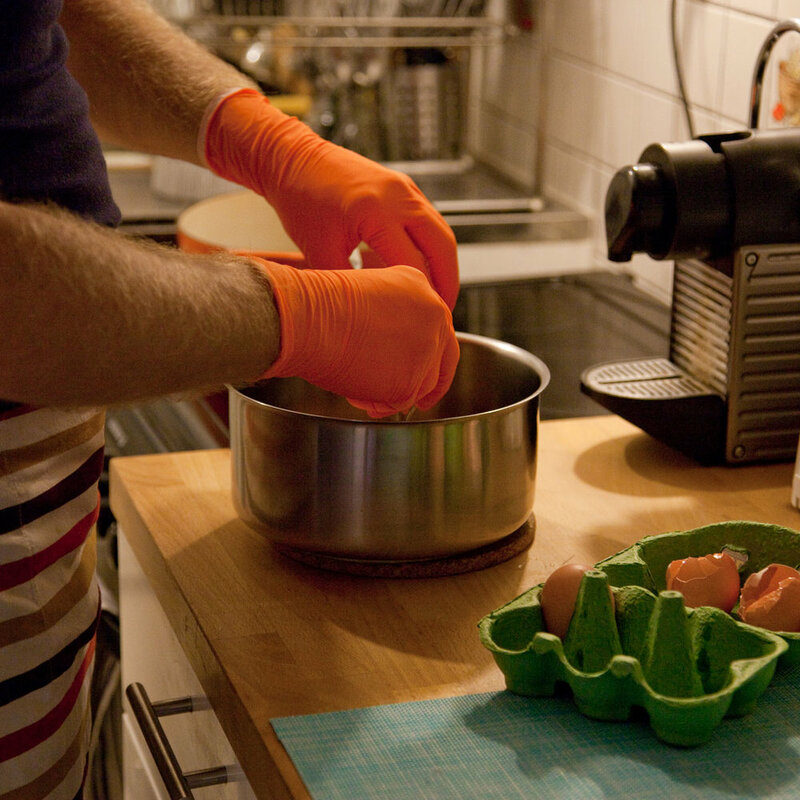 Parisian kitchens can be tiny and easily cramped with stuff so he decided to keep the gloves on to distract from the overflowing surroundings and to draw attention on his scrambled eggs à la française that he was about to cook up for me. This was all in good fun but as an afterthought...probably a safety hazard to keep the gloves on. Do Not Replicate!! Burnt rubber stuck to skin will hurt!! This morning I was getting an all in one surprise package: a cooking lesson and a power breakfast. I thought scrambled eggs was just cracking an egg into a pan and stirring it all up until scrambled. Who knew? Patience though. This is a slow cooking process and adding good whole fat to the eggs adds taste to this creamy version of scrambled eggs. Do not expect a light, airy, and fluffy version. It makes a great spread over toast. First prepare a bain marie. Fill a medium pot with water less than halfway and bring it to a boil. During this time prepare your eggs. Add the eggs in heat proof bowl and beat it with a fork. Add the buttermilk and stir. Now place the bowl over the pot of simmering water and stir your egg mixture around with a spoon. This is a slow cooking process. It takes about 15 minutes or so. Once it starts to get creamy, take the bowl off the pot and add the butter. Continue stirring until it gets scrambled. 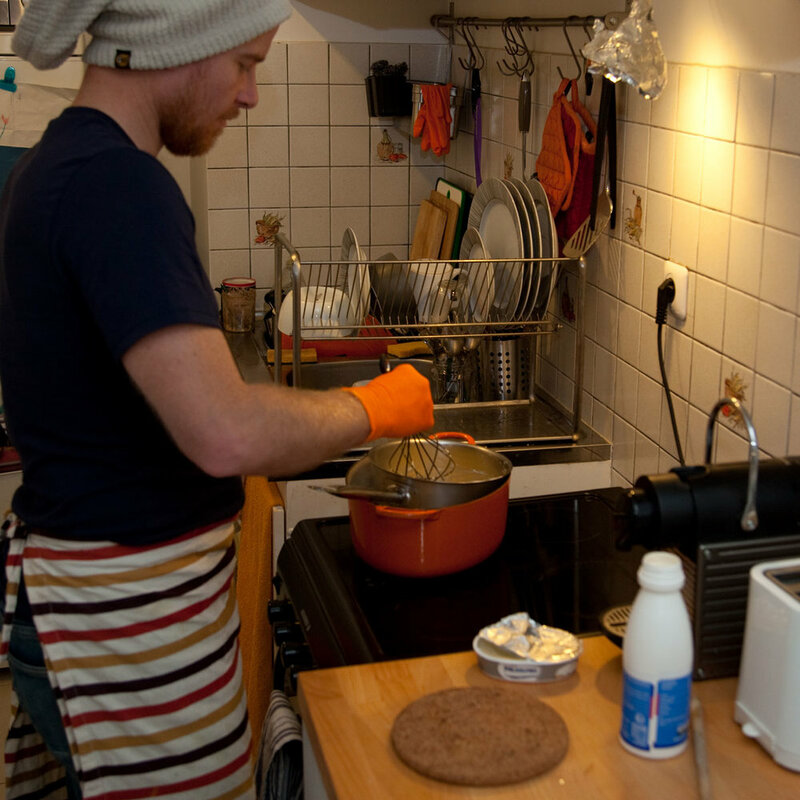 Improvisation plays a huge role in the kitchen for me and as you see from the photos we don't have all proper or called for material like a heat proof bowl, nor buttermilk, etc. Fred used Philadelphia cream and a heavy cream with the eggs. It turned out fantastic. So use your instincts and don't be put off from making something just because you don't have the exact ingredient.